Have you heard of any funnies, jokes, or humor lately that you haven't heard some variation of before? Well, many of the funnies on this site have come from decades of telling passed down through the generations. You've likely heard of many feuds throughout the years - the Hatfields and the McCoys, dueling banjos, Family Feud (the TV show), not to mention numerous duels that have likely taken place in your own living room! 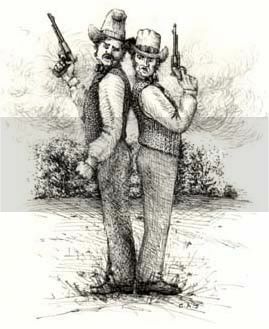 Two men, Shot and Not got into a duel. Now the shot that Shot shot, shot not Not, but shot not at all. But the shot that Not shot, shot Shot. Now Shot being shot, and Not not, Not won, Not withstanding.